Brand Identity & Packaging Design Thermos innovation has lead to the hottest, coolest, and freshest products since 1904. 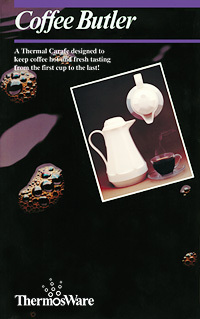 Constant technological advancement and new product development has made Thermos the industry leader for over a century. In tandem with the company's expanding range of innovative, fashionable products, Thermos was seeking to reposition its traditional carafe and target it toward the burgeoning market of contemporary coffee drinkers. Design Latitudes developed a robust and exciting new brand identity that connotes the retention of liquids which was integrated into a more fashionable new retail packaging programwhich was so successful the company was able to place their Coffee Butler product line in Bloomingdales for the first time.